Today’s blog in our series showcasing standout examples of Americana that will be offered at the Winter Antiques Show January 19–29 at New York City’s Park Avenue Armory looks at a fine example of silver. 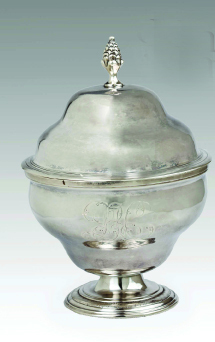 This circa 1770 piece surely ranks high among the best examples of Connecticut silver and was made circa 1770 by Samuel Parmelee, a renowned silversmith in Guilford, Conn., which in its heyday was the home of two talented silversmiths, Billions Ward (1729–1777?) and Capt. Samuel Parmelee (1737 –1807). Jonathan Trace, Portsmouth, N.H., who specializes in antique American silver and American furniture from the Seventeenth to the early Nineteenth Century and Seventeenth–Eighteenth Century American and European art, will feature this item in his booth at the Winter show. Captain Parmelee was well known around town and received his title of captain in 1775, and served active in the Revolution, according to the museum. For more information, contact Trace at 603-431-1197 (not during show hours). Make sure to visit the dealer’s booth at the Winter Antiques Show to see this and other fine American works of beauty. For show information, www.winterantiquesshow.com or 212-987-0446.